As the only heir of the immensely wealthy and powerful Clinton family, Chelsea has been thrust into the public spotlight following her mother’s electoral defeat. Unfortunately for the Blue Tribe she is supposed to lead, Mrs. Chelsea isn’t too bright. Her Twitter comment was intended as a critique of the claim that Confederate statues and monuments should not be torn down because they symbolize part of America’s history. This statement depends entirely on churches Chelsea has personally visited. “I have not personally seen this” is a bad argument. 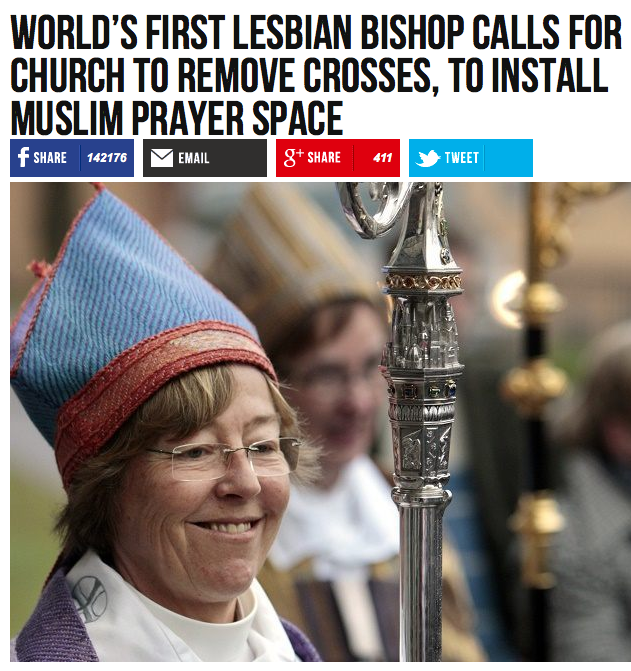 All it takes is a few churches she hasn’t attended that happen to have Lucifer statues to disprove her whole point. And if you know anything about churches, you know that some of them have an awful lot of statues. 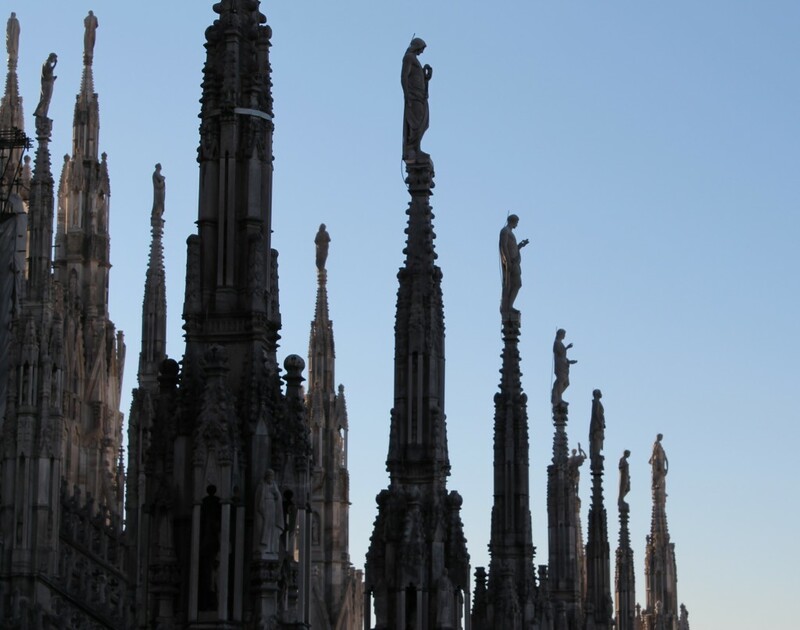 The Milan Cathedral has 3,400 of them! They cover these things with gargoyles–do you really want to make a political argument that hinges on whether or not there’s a Lucifer in there somewhere? 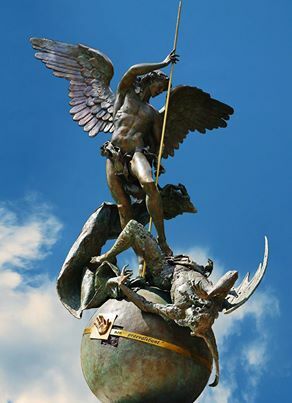 But you don’t have to travel to famous Italian cathedrals to hunt for the Devil; I have a statuette of Satan defeated by Michel the Archangel about ten feet away on my mantle. Do you know how many statues there are of this guy? Both Popes got together in 2013 to consecrate a new statue of him–complete with Lucifer–in the middle of the holy Vatican City. But even if we limit ourselves to freestanding statues solely of Lucifer himself–not of him being defeated or crushed, not in symbolic form nor painted on the walls, we still have this rather cute little Devil seated outside Marienkirche church in Lübeck, Germany; this large and creepy statue of Lucifer tangled in power lines in the Holy Trinity Church in Marylebone, Westminster; a frightening devil from the church of Sainte-Marie-Madeleine de Rennes-le-Château; Satan pushing the damned into the Leviathan’s mouth, a 12th century Romanesque Carving from the Church Sainte Foy, France; Satan again; carving of Satan being cast out of Heaven from Pisa, Italy; the Devil weighing souls and leading away the damned, Notre Dame, France; another from Notre Dame; devils carved into a church in Lincolnshire, England; a little devil in St. Severin, France; Satan on a pillar, Chatellerault, France; statue of the Devil at the Grotto of St. Anthony, Belgium; and for that matter, there are a lot of frankly obscene carvings in older churches. 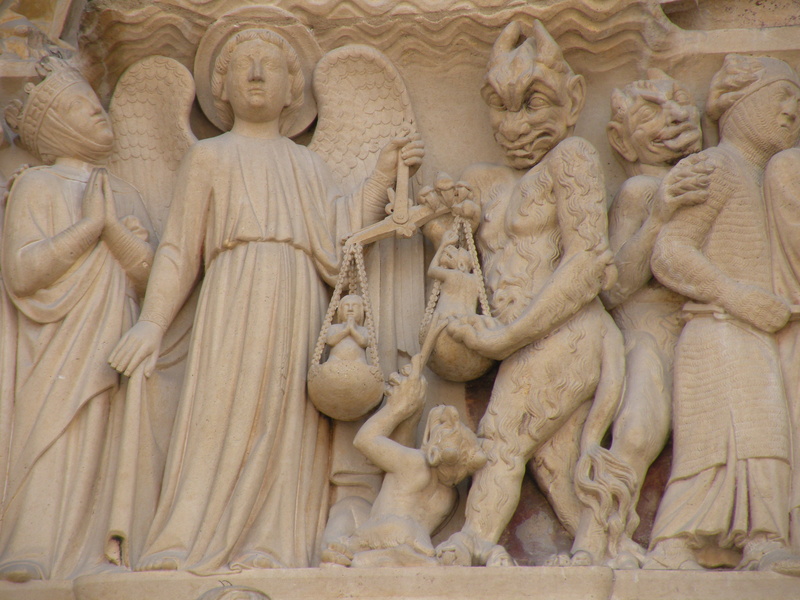 We could do this all day, but I think you get the point: there are a lot of depictions of the Devil in Christian churches. Having been raised Methodist is no excuse; somewhere between attending Sidwell Friends, Stanford, Oxford, Columbia, etc., Chelsea has surely learned something about European art. Considering Chelsea’s level of worldliness–one of the privileged glitterati who get to spend their lives drifting from board to board of different companies and exclusive soirees for the rich and famous–you’d expect her to have at least noticed the carvings on a European cathedral or two. Even Chelsea’s writing career shows few signs of brilliance: she’s written two books for kids (one of those a picture book) and co-authored one for adults, which has–wow–absolutely rock-bottom reviews. Considering her kids’ books got good reviews, I don’t think this is a troll campaign–it looks like her book is actually terrible. Unfortunately for the increasingly old and decrepit senior Clintons, lack-luster Chelsea is the only egg in their basket: they have no other kids to prop her up or take the limelight for her. 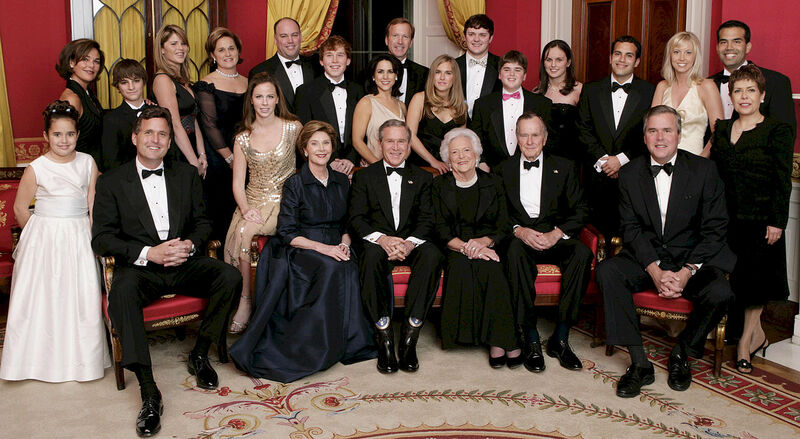 The Bush family in the Red Room of the White House (January 2005). By contrast, President and first lady George H. W. and Barbara Bush had 6 children–George Walker Bush, Pauline Robinson “Robin” Bush (1949–1953, died of leukemia), John Ellis “Jeb” Bush, Neil Mallon Pierce Bush, Marvin Pierce Bush, and Dorothy Bush Koch. George “W” Bush, although not noted for intellectual excellence, managed to follow in his father’s footsteps and also become President; his brother Jeb was governor of Florida; and Neil and Marvin are doing well for themselves in business. 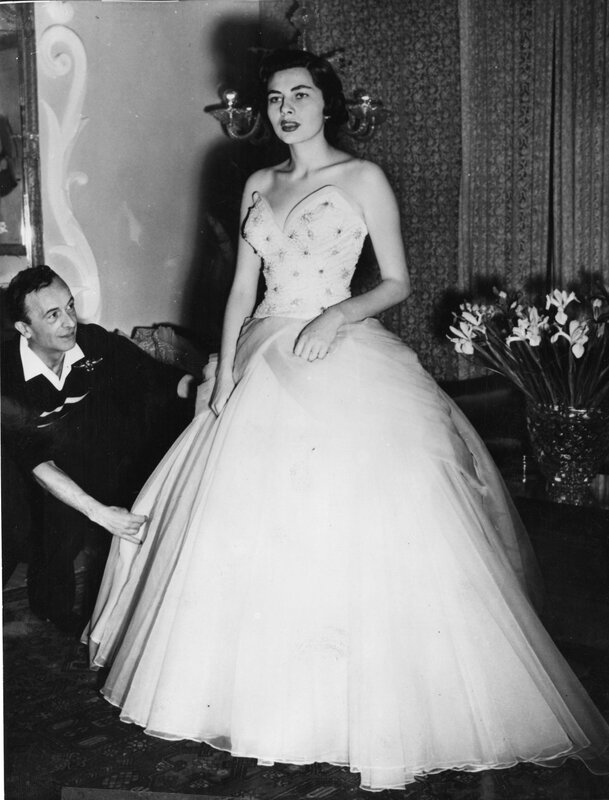 According to Wikipedia, George and Barbara’s five surviving children have produced 14 grand children (including two adoptees) and 7 great-grandchildren, for a total of 24 living descendants. Chelsea Clinton, while obviously younger, has only 2 children. Having one child is an effective way to concentrate wealth, but the Bush family, by putting its eggs into more baskets, has given itself more opportunities for exceptional children to rise to prominence and make alliances (marriages, friendships) with other wealthy and powerful families. The Clintons, by contrast, now have only Chelsea to lead them. Emile Durkheim (April 15, 1858 – November 15, 1917), Karl Marx, and Max Weber are the fathers of modern social science and sociology, so I decided to read Durkheim’s essay, The Origin and Development of Religion. Durkheim saw religion as the most fundamental social institution of humankind, and one that gave rise to other social forms. It was the religion that gave humanity the strongest sense of collective consciousness. Suicide rates are higher in men than women (although married women who remained childless for a number of years ended up with a high suicide rate). Suicide rates are higher for those who are single than those who are in a sexual relationship. Suicide rates are higher for people without children than people with children. Suicide rates are higher among Protestants than Catholics and Jews. Suicide rates are higher among soldiers than civilians. Suicide rates are higher in Scandinavian countries. The higher the education level, the more likely it was that an individual would choose suicide. However, Durkheim established that there is more correlation between an individual’s religion and suicide rate than an individual’s education level. EvX: Note that Durkheim is not limiting his use of “Church” to Christian denominations. 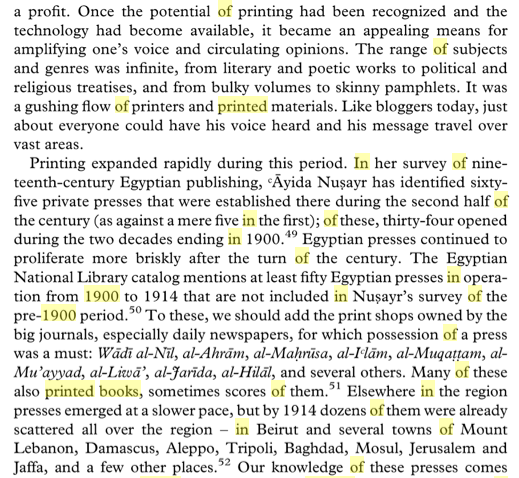 EvX: I find it interesting that all of the “social sciences”–anthropology, sociology, political economy, psychology, and possibly economics–became prominent at about the same time (compared to, say, History, which got its start with Herodotus in the 5th century BC.) As we’ve been discussing, the late 1800s was a time of great social turmoil due to the economic dislocations and changes wrought by the Industrial Revolution and mass movement of millions of peasants from their traditional homes in the countryside to ghettos and tenements of the cities. Communism–most notably in its Marxist form–was one reaction to this dislocation. Durkheim, while a socialist, was not an internationalist, and he seems to disagree pretty strongly with Karl “religion is the opiate of the masses” Marx on the importance of religion to society. To Durkheim, religion (as opposed to magic) was absolutely foundational to a functioning society, and believed that despite the increasing atheism of his age, nothing functionally similar to religion existed. But–from an anthropological perspective–is Durkheim correct? Do the members of a “Church”–and note here the implication that for people to have this collective identity, there must be some homogenous thing that they all believe, not some hodgepodge of “individual interpretation–see themselves as a collective group, and do the believers in “magic,” inversely, fail to see themselves as similarly collective? Durkheim’s work on religion was criticized on both empirical and theoretical grounds by specialists in the field. The most important critique came from Durkheim’s contemporary, Arnold van Gennep, an expert on religion and ritual, and also on Australian belief systems. Van Gennep argued that Durkheim’s views of primitive peoples and simple societies were “entirely erroneous”. Van Gennep further argued that Durkheim demonstrated a lack of critical stance towards his sources, collected by traders and priests, naively accepting their veracity, and that Durkheim interpreted freely from dubious data. At the conceptual level, van Gennep pointed out Durkheim’s tendency to press ethnography into a prefabricated theoretical scheme. But perhaps we should let Durkheim defend his points. 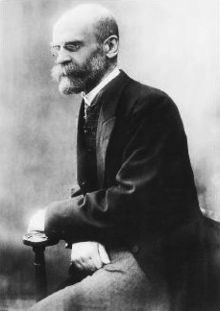 Durkheim then runs through in the essay a couple of the more popular (atheistic) theories of his day on the origins of religion, such as “primitive man was amazed by nature and assumed therefore that natural phenomena must be the work of divine creatures,” and dismisses them on the grounds that they are inadequate to explain the fervency of people’s religious devotion. The fact that rain falls from the sky may be amazing, but even primitive man was not particularly wowed by this fairly regular and ultimately mundane occurrence. “At the basis of nearly all the Australian tribes we find a group which holds a preponderating place in the collective life: this is the clan. … the individuals who compose it consider themselves united by a band of kinship, but one which is of a very special nature. … This relationship does not come from the fact that they have definite blood connections with one another; they are relatives from the mere fact that they have the same name. 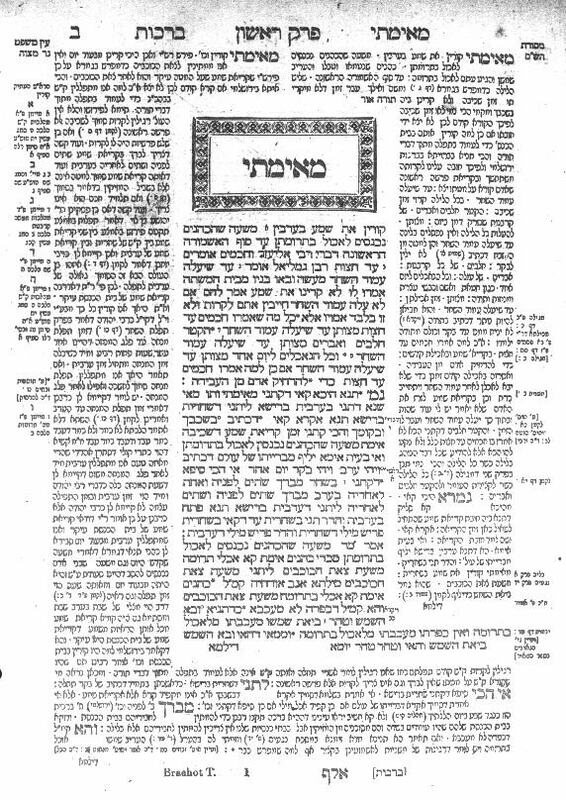 … When we say that they regard themselves as a single family, we do so because they recognize duties toward each other which are identical with those which have always been incumbent upon kindred: such duties as aid, vengeance, mourning, the obligations not to marry among themselves, etc. This totemism plays an important part in the social life of the aboriginals. If, for example, a person has committed an offense, or has broken tribal law, he becomes a fugitive. He may travel to some distant part of the country. … He creeps along stealthily, listening intently for any sound, peering through the dense foliage in every bay or cove to see whether his path is clear, noticing every footprint on the way, reading every mark on the tree-trunks and on the surface of rocks, and scanning every mark to see whether there is hope of protection and friendship. To be seen would mean death to him. By and by the keen eye of the fugitive catches sight of the figure of his mother’s totem. Casting aside all fear, he walks boldly along the beaten track that leads to the camp, and presents himself to the chief. He produces a string of kangaroo teeth, made in bead fashion, and a bunch of emu feathers… . This is a sign that he belongs to the Kangaroo totem tribe, and that his mother belongs to the Emu totem tribe. He is received into either of these tribes, and becomes one with them, and participates in all their privileges. 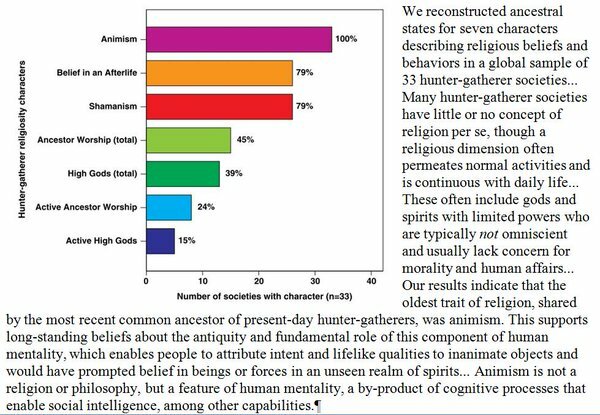 Ramsay recounts a number of folktales in which tribal membership (symbolized by the tribal totem) is important, including a number of tricksters tales in which a character cheats members of another tribe by claiming to be a member of their tribe via some ancient union between their peoples. I must caution against overuse of the word “sacred.” For while we might not approve of hunting bald eagles for sport, we wouldn’t typically call bald eagles “sacred” in the religious sense. “Thus the totem is before all a symbol, a material expression of something else. But of what? Evx: So, to summarize: the collective moral force of the community gives rise to the idea of the sacred, which creates religion, which in turn creates society, civilization, and all of the good things. Which is circular, but so is gene-culture-co-evolution, so I suppose I can’t fault him on that count. The obvious critique here comes from religion: believers would likely object that their religion hails from an actual, real encounter between men and God(s). This explanation, though, runs into the difficulty of explaining all religions besides one’s own. Durkheim is attempting to create an explanation that applies equally to all religions, without appealing to any actual divine agents. Leaving aside the reality of divinity, does Durkheim’s theory ring true? I am not convinced that he understands totemism, nor am I wholly convinced on the matter of magic, either. However, I his basic theory about the importance of religion underlying society, and possibly the importance of society underlying religion, seems on the correct track. Some form of common belief in the unity of the people of a society seems important to an actual society. Let us suppose, for a moment, a society in which there are many ethnic groups, but they all believe in the same religion. This seems like a reasonably workable society where people can see themselves as having enough in common to work together. 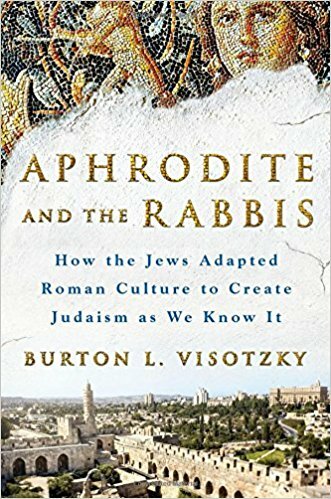 For example, Israel is a nation composed of many different ethnic groups which, nonetheless, all believe in Judaism and share an identity of themselves as “Jewish.” This works for them. Let us also suppose a society with one ethnic group, but many religions. Since people prefer to marry within their own religion, creating the conditions for ethnic differentiation, we must suppose that the religions involved are sufficiently similar that people are still willing to inter-marry. This also seems like a reasonably workable society. According to Pew, Taiwan and Vietnam are among the world’s most religiously diverse countries, but they are (as far as I know) ethnically quite homogenous. I confess that I don’t know much about civic life in Taiwan or Vietnam, but they seem to be holding together. But suppose a third society, in which people belong to many different ethnic and religious groups: this seems in danger of becoming several different societies living in close proximity to each other. The US is an interesting mix of forms. The initial founding stock consisted largely of Christians from northwest Europe and animists from Sub-Saharan Africa who quickly converted to Christianity. Most immigrants to the US have been Caucasian and/or Christian of some variety, eg, Mexicans, Quakers, Italians, Ashkenazim, Irish, Poles, and Puritans. By contrast, when Malcolm X decided to convert to Islam, this was–at least symbolically–a way of breaking from the religious continuity of American Christianity. As a black separatist, he was no longer linked to white American society.